Until recently, internal use of the armed forces has been generally regarded by the public, as well as academic commentators, as conduct to be expected of a military or autocratic regime, not a democratic government. There is however growing concern that the 'war on terror' has been used to condition public opinion to accept the internal deployment of the armed forces, including for broader industrial and political purposes. This book examines the national and international law, human rights and civil liberties issues involved in governments calling out troops to deal with civil unrest or terrorism. 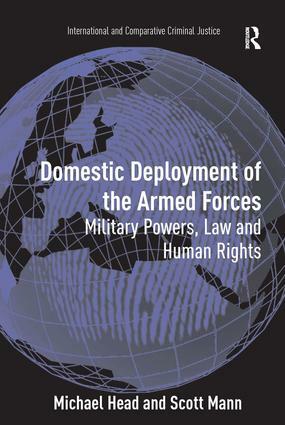 As the introduction of military call-out legislation has become an emerging global trend in the opening years of the 21st century, there is considerable and growing interest in the constitutional and related problems surrounding the deployment of military forces for domestic purposes. Examining the changes underway in six comparable countries, the United States, Canada, Britain, Germany, Japan and Australia, this book provides a review and analysis of this trend, including its implications for legal and political rights. Dr Michael Head, Associate Professor of Law at University of Western Sydney, is a well-known Australian writer on civil liberties, and has written extensively in legal journals and the media on the military call-out laws. He is author of Administrative Law: Context and Critique (Federation Press 2005); Law in Perspective: Ethics, Society and Critical Thinking (with Scott Mann, UNSW Press 2005) and Evgeny Pashukanis: A Critical Re-Appraisal (Cavendish-Routledge 2007, forthcoming). Dr Scott Mann, Associate Professor of Law at University of Western Sydney, has published extensively on legal and human rights issues. His recent books include Economics, Business Ethics and Law (Thomson, 2003) and Law in Perspective (with Michael Head).